Elizabeth Peddey offers private, customised, and small group cooking classes and group cooking courses from her home kitchen in Elwood, Melbourne, Australia throughout the year. Small group Italian cooking classes in English are given from her kitchen in Pisciotta in the south of Italy over the Italian Summer. Elizabeth also offers a very special gastronomic and cultural experience with her Italian Food tours of Cilento. Accommodation in Pisciotta is available throughout the year at Casa San Marko. Elizabeth has a Master’s degree in Gastronomy awarded by Le Cordon Bleu in conjunction with the University of Adelaide. She is a committee member of the International Wine and Food Society, Victoria branch, Asia Pacific region, and an active member of the Ladies Wine and Food Society, Melbourne. Elizabeth is a volunteer in the Elwood Primary School Kitchen Garden program. Elizabeth’s experience spans many years within the food industry. She has worked as a culinary consultant, cook, teacher, television presenter, food writer and caterer. She lived with her family in Italy in 2001 and has returned regularly ever since. In 2012 the Peddey family purchased a home in the historical centre of the medieval village of Pisciotta. 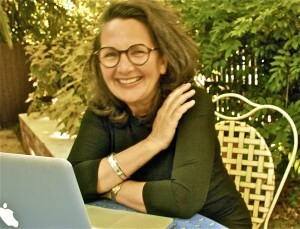 Her association with Italy, in particular in Campania and the Cilento, has fostered an interest in the food and wine of Italy and the Mediterranean. Elizabeth is a self-taught, home cook; she is the mother of three adult children and lives between Elwood, Melbourne with her husband Mark, and Harriet the cat and their house in Pisciotta in the south of Italy. Elizabeth is the founder of Elizabeth Peddey School of Cookery and Gastronomy – Elwood. The Italian School of Cookery and Gastronomy in Pisciotta opened with cooking classes in 2016. Elizabeth sees cooking as a practical and social skill, fundamental to the regular enjoyment of the pleasures of good food and wine. She is passionate about the demystification of this process and challenges the low levels of kitchen confidence that compromises so painfully what, how, and when we commonly choose to eat and drink. Elizabeth invites people of all age groups, who want to make good food and wine an every day reality for themselves and those they care for, to join her in a practical and fun environment at the Elizabeth Peddey School of Cookery and Gastronomy. Group and Private Cooking Classes and Courses are provided from Elizabeth’s home kitchen in Elwood, Melbourne, Australia throughout the year. Cooking Classes are available from Elizabeth’s home kitchen at Casa San Marko, in Pisciotta (Salerno), Italy from June to October. Elizabeth’s Food Tours highlight the very best of the gastronomic and cultural experiences available in the Cilento Region, in Campania in the South of Italy. Bed and Breakfast and whole house holiday rental is available in Casa San Marko, Pisciotta, Italy throughout the year.